As you all must be aware by now, this is totally not working. Gimmie the next two days off and come back on Monday for comics, then I'll finish the current story and take about 5 weeks off while running the first rejected complete storyline that killed my first buffer years ago (and later turned into the caption contest) in favor of using the "alternate dimention" idea better with the 3D effects library story. That'll give me the time to work up a buffer again and snazzy up the site while giving you all something to look at during the downtime. How's that sound? I apologize, it's 6am and a 1980's wigga' themed french restaurant seems funny to me, but I'm awake enough to realize that I probably only think that because it's 6am. Also, even at my peak, my rhymes are neither funky, nor fresh (despite those terms seeming completely conflicting with each other). 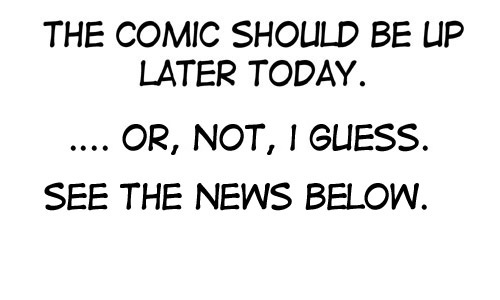 Comic Buffer = Aww, crud! sorry, I'm behind on everything, not just the comic. Comic Buffer = Still no buffer, but still keeping up. Comic Buffer = Gaaah, I ran out of buffer already! Sorry, sorry. Here's a filler, and I'll have four comics and one filler next week. Damn, not even back a month and I already drop the ball. HAPPY BIRTHDAY TO ME! 1/4 of a century down. Guess what? I start back on the long road to becoming a real animator today! I'm enrolled in the winter session of AnimationMentor.com. Don't worry, I'll keep up on the comic as it's only one class at a time and an online one at that to work around my schedual. I'll keep you all updated on my how my classwork is going. WOOHOO, ANIMATION!! Thanks a bunch to those that do. Ok, editing fit cost me a comic or two, but worth it to avoid putting out a sub-par product. And here's January's Babe of Mad Science. HAPPY NEW YEAR Everybody! Ok, so January's "Babe of Mad Science" is put off 'til thursday and thursday's sketchbook page filler is up today. It's taking me a bit to get back into the swing of doing the pin-ups, but the comic drawing is going smooth! I'm gonna keep a note here with the status of my comic buffer not just so you all know what's going on, but for my own reference too. Also, very important, I lost the old Madaboutu.com domain because the registrar I had used got in the habit of ignoring thier customers. So I've got a new domain all set up as Madaboutuonline.com for the site. Tell your friends, write it in your love notes, get it tatooed on and inappropriate body part! The real reason for the damned hiatus is my own bad storytelling. My big plans for the storyline ended up with me writing myself into a corner. And that first bit of stalling dragged on and I kept coming back to it a dozen times throughout the year, never finding a solution. But I've FINALLY figured out what to do and how it will fit (It's more than just the cop-out it appears to be). Anywho, starting in January I'm gonna move up to 5 updates a week, 3 of which will be actual comics while Tuesdays and Thursdays will be experiments and fillers such as the beloved "Babes of Mad Science" as well as random pin-up pics, sketchbook pages, and some new little treats. The card game is indeffinetly on the back burner as I have absolutely no idea how to publish it, or even regular play-testers anymore. The books are back on, I'm almost done with the 'Cast and Crew Commentary' on the first one with just the bonus story and actuall arranging left. Now I gotta get back to building a bigger buffer. Later!